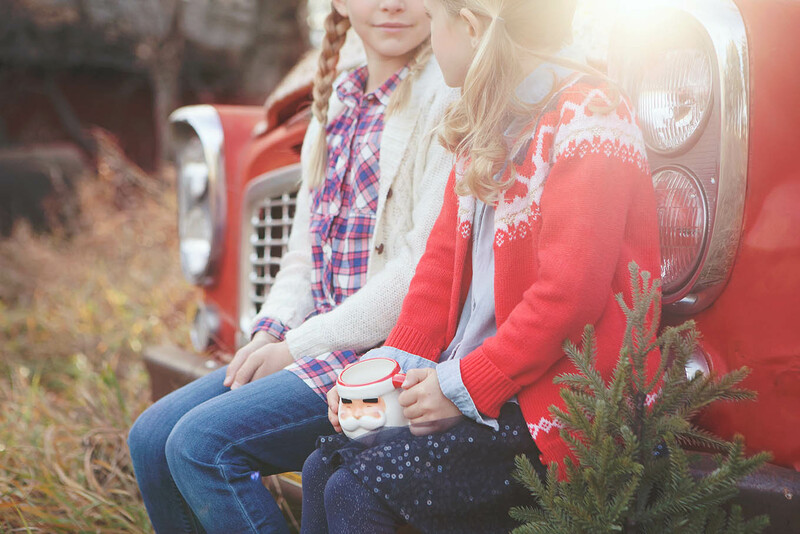 This year, do you want photos that capture the magic of the season without requiring you to be stuck behind the camera during all of the fun? 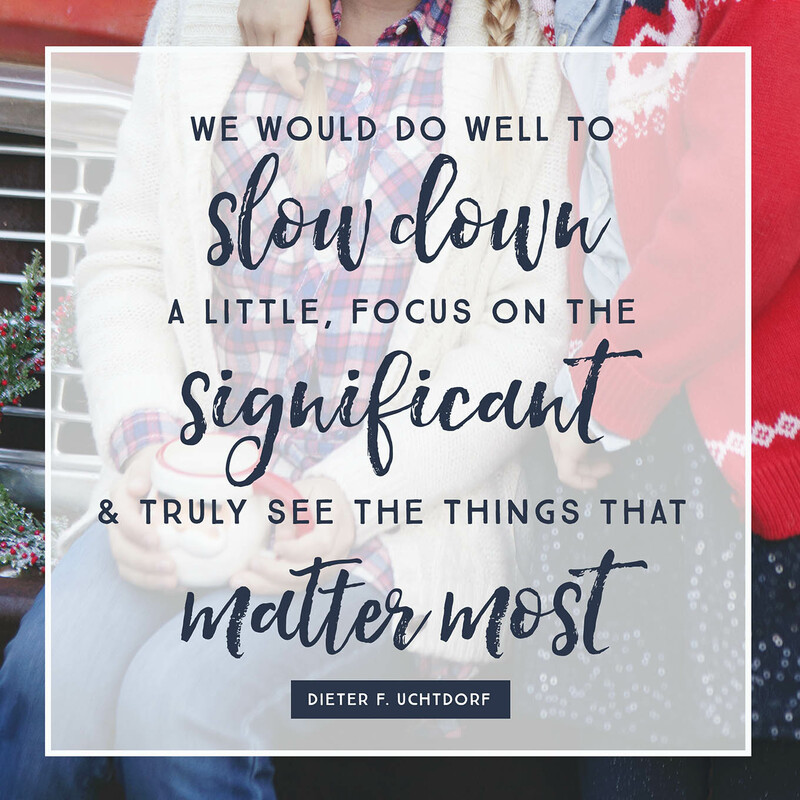 Do you want to focus on family this month and be IN those memories, instead of always watching them through the lens? 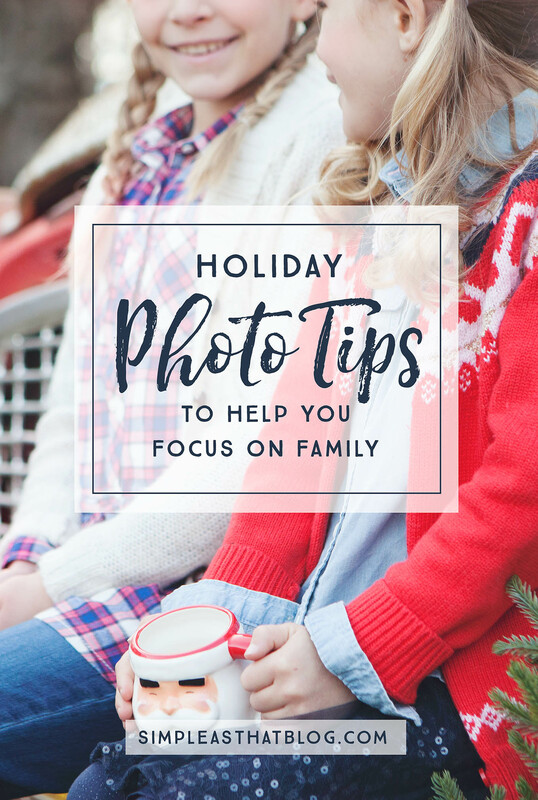 These tips will help you capture the photos you really want while still allowing you to be present and focus on the joy of family during the holidays. Christmastime provides so many picturesque photo opportunities, and as moms, we can sometimes get a little over-zealous about capturing the holiday magic. We want to remember this fleeting time, and what better way to do that than with photos? 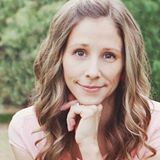 I’ve been that mom—believe me. One Christmas, we were squeezing in a quick Santa visit between a holiday party and some Christmas shopping. I had this vision in my mind of the perfect photo I wanted to capture. I was on a mission. Four grumpy kids—ages 7 and under—climbed up to tell Santa their wishlists. When my 3-year-old hopped off his lap, I was so determined to get a cute photo of the baby that I completely missed the excited expression on her face when Santa gave her a candy cane and she tried to show me. By the end of it all, two of the kids were in tears, I was frustrated, and the holiday magic… well, it wasn’t a magical moment at all. I was so focused on getting the perfect photo that I forgot about all of the reasons I wanted that photo to hang on to. Since that experience I’ve tried to maintain more balance when it comes to capturing the holidays. Of course, it can be a difficult line to walk, the line between capturing it all and being all there. 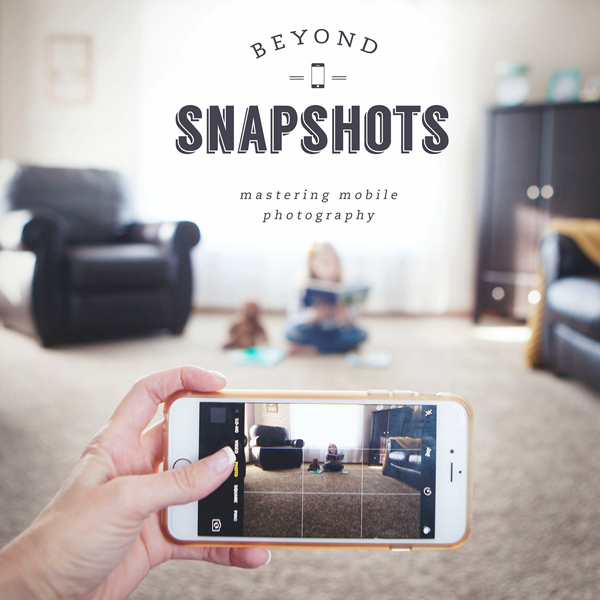 I hope these tips help you take memorable photos and be a part of those memories with your family. 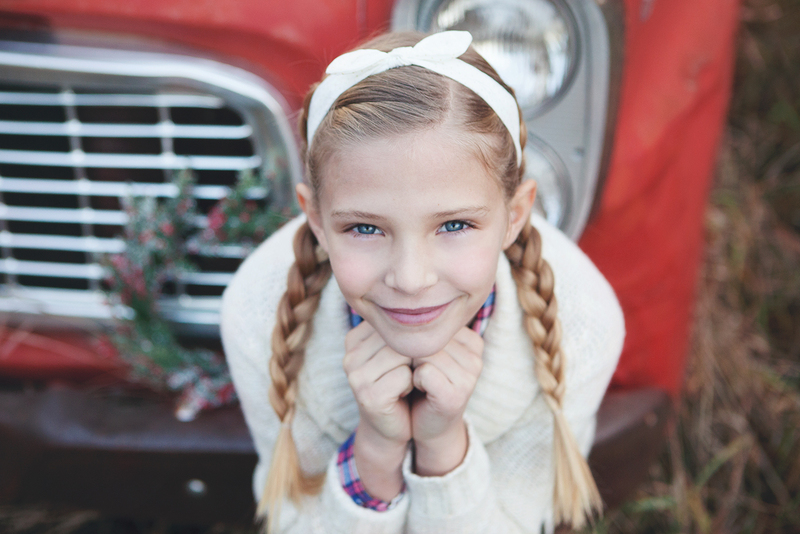 Create holiday photo traditions that family members can look forward to. We take photos in Santa hats each year, because it’s so fun to look back on these yearly photos and see how much the kids have grown and changed. As a reminder, make it more about togetherness and having fun, and the memorable photos will follow. Even if they aren’t perfect, the memories will be. I do make a special effort to take some posed photos this time of year, and in order to not to disrupt my desire for a simpler holiday season, I try to take them as early as I can. 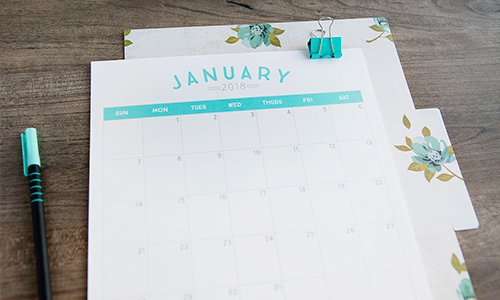 Whether it’s family photos with a professional photographer or photos at the mall with Santa, plan to take them earlier in November or December to allow yourself to focus on the other reasons for the season later in the month. Getting them done ahead of the game allows you to truly enjoy and take in the moment. For these photos of my girls, we made it a special outing. 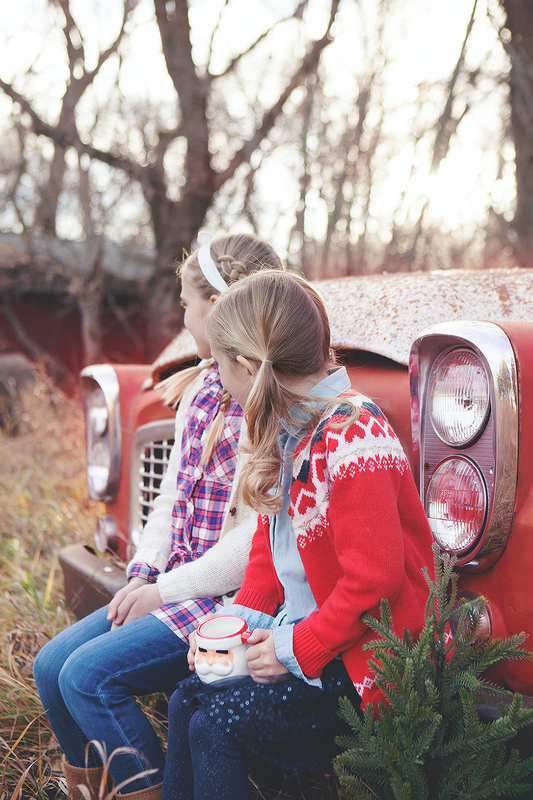 The temperatures are starting to dip here in North Dakota, and these girls can hardly wait for the first snowfall. 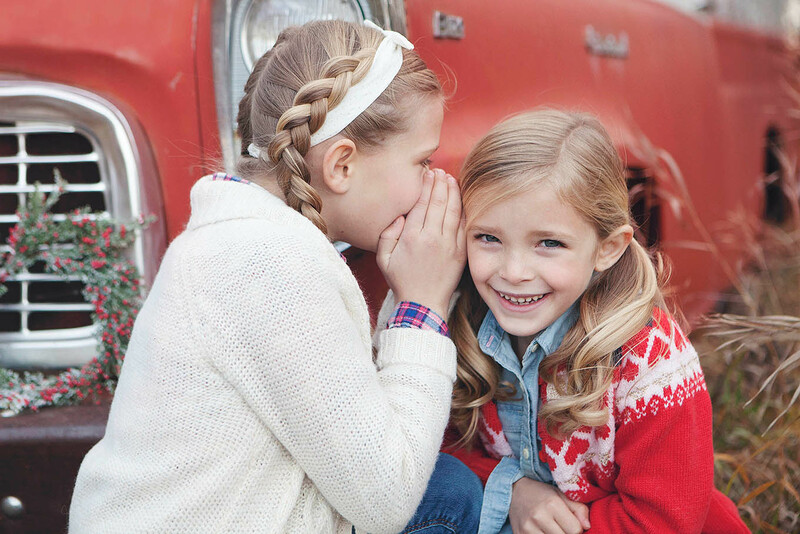 They didn’t need much of an excuse to get dressed up in their cozy sweaters and warm flannels from Oshkosh B’Gosh. The clothes they’re wearing this winter are a far cry from the sandals and t-shirts they were sporting last holiday season when we were living in Arizona. The novelty of hats, mittens, warm sweaters and socks are not lost on these kiddos! 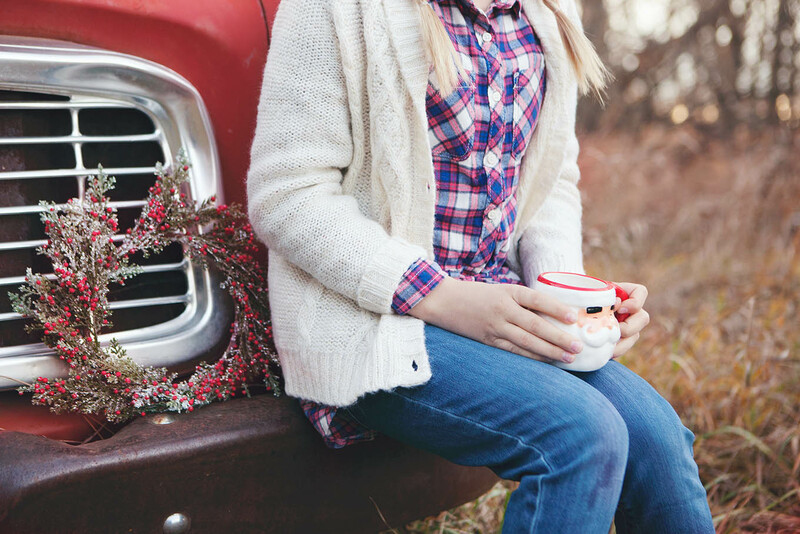 For our first winter in North Dakota, it’s all about staying warm, and I’m so excited with how stylish, cute and functional these clothes are! The cold is no joke here, and while dressing my girls cute for holiday photos is fun, we need to be practical and dress for the weather. 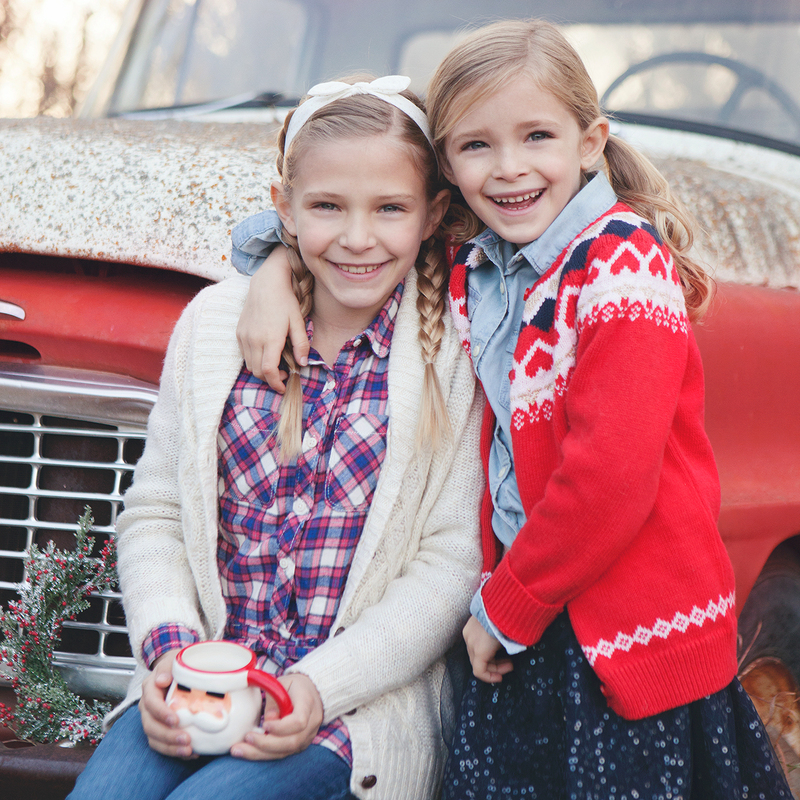 I love that these outfits from Oshkosh B’Gosh and so many of their other winter pieces do just that. 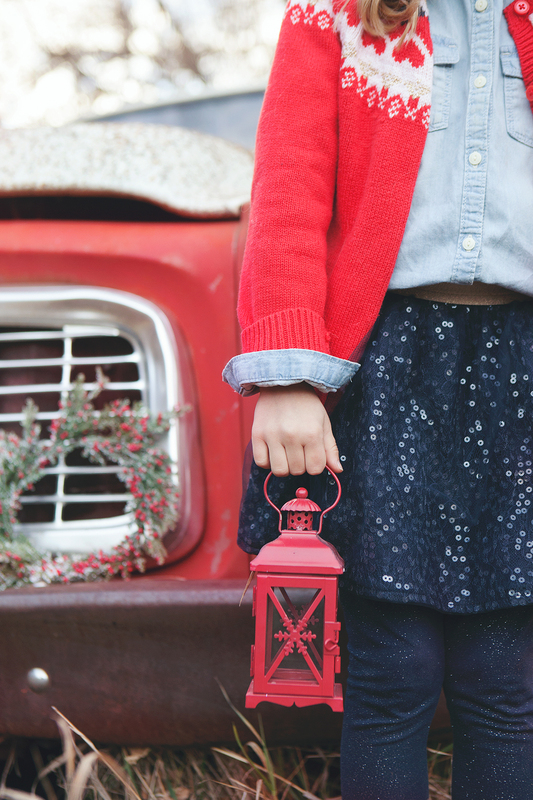 Add a seasonal touch to your photos to make sure they have “place,” or a point of reference. A photo by the Christmas tree or kids in cozy, Christmas-colored sweaters, holding a favorite ornament. These little details are what make this time of year so magical. Be sure to include them in your images. This red truck served as the perfect backdrop while we sang carols, snuggled up to keep warm, and then went home to enjoy hot chocolate. Photos help me remember the feelings of the holidays long after the Christmas magic has faded, the carols have stopped playing, and the tree is packed away. Looking for moments of connection and taking a quick second to capture them— whether it’s with my phone or my big camera—help pull my mind away from my endless to-do list and back to what really matters this time of year: family. Facilitate moments of connection. When taking photos. I’ll ask my kids to snuggle up, give each other a hug, tell each other one thing they love about the other, or whisper a secret to each other. Sometimes when a camera is pointed on them, family members need a little push in the right direction to demonstrate affection and admiration. Don’t force it. If it’s not working, if kids aren’t interested in being in photos or sitting next to their sibling (let alone giving them a hug! ), let things go and revisit in a few minutes, hours or another day entirely. Wait for the right moment. A lot of what goes into capturing a memorable photo is patience, while you wait for the right moment to present itself. Pulling out my camera instantly heightens my awareness of family togetherness and the small details of the holidays I never want to forget. Allow your camera to be a tool that helps you slow down and really see the holidays through a new lens. The lens of excitement that your children have for Christmas day. The lens of gratitude for blessings that surround you every day. The lens of love that helps you see your family members’ very best sides. Be mindful of when enough is enough, and be ready to put your camera away. 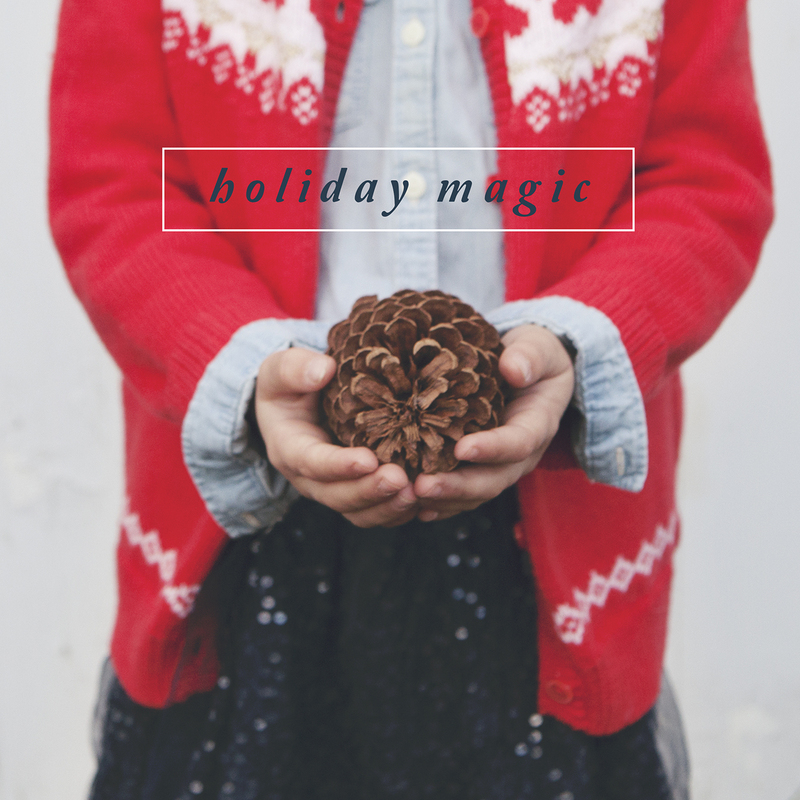 There’s only so much holiday magic that can translate in photos. The rest of the magic is in the moments with family closely snuggled on the couch reading Christmas stories, discussing the magic of Santa while tucking little ones into bed on Christmas Eve, and in watching a loved one’s face as they open that special gift you made just for them. Don’t miss the real magic, while trying to capture it. 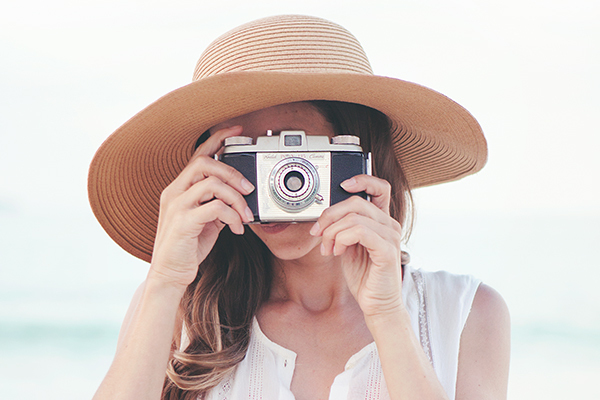 Make a list of the photos that are a priority for you to capture this Christmas, and once you’ve crossed them off your list, be content to turn your camera off and give your family your undivided attention.